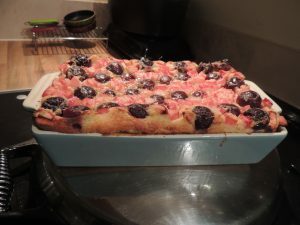 Yves is looking forward to sharing his bakery secrets this Sunday with Julia Lewis and her BBC Radio York listeners. Here’s a flavour of the bake he’ll be discussing on the The ‘Bake of the Day’ feature. Preheat the oven to 200°c. In a large bowl, whisk together the milk, eggs, sugar, and butter until the sugar is dissolved. Add the flour and whisk until smooth. Pour the batter into a pie dish. Now add whole cherries with stones and rhubarb cut into dices. Bake until the clafoutis is beautifully puffed and golden, 30-35 minutes. Serve warm. 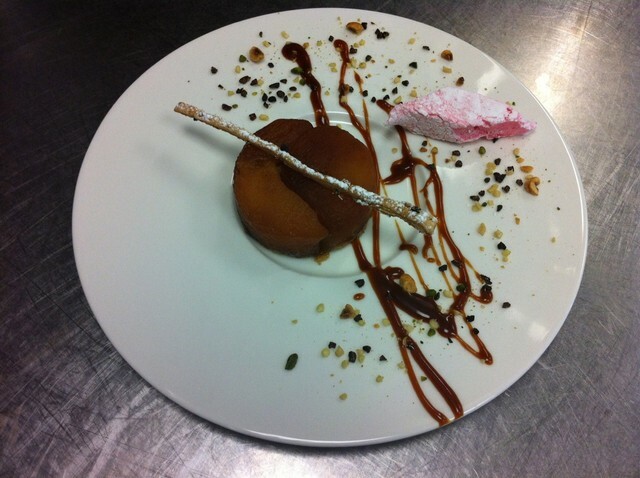 Serve with custard, fruit coulis or vanilla ice-cream. This week, 10-16 October marks National Chocolate Week. We love chocolate and we love using chocolate in our recipes. Who doesn’t love a chocolate dessert to finish a meal? The perfect chocolate dessert deserves the perfect chocolate, so below are our recommendations for which chocolate is best for which recipe. 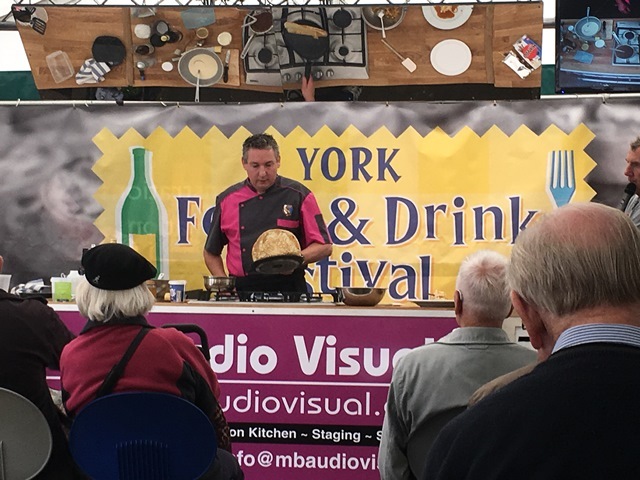 Yves brought the flavours of France to York this week when he demonstrated his culinary skills at the annual York Food and Drink Festival. With a taste trail, food producers market and cookery classes as well as chef demonstrations, the festival which is held in St Sampson’s Square attracts large numbers of gourmands from all around the UK. Combining the traditional gourmet flavours of France with seasonal fresh local produce, Yves’ used Yorkshire apples, honey and beer to create his dish – roasted apples and honey wrapped in a crepe made with Minster Ale, produced by York Brewery and served with Calvados. After enthusiastic sampling by the assembled crowd, all agreed it was a tasty cross-cultural triumph! The festival is now over for another year but runs each September and is well worth a visit. As the end of summer draws ever closer, we are helping you to make it last that little bit longer with our latest pop up event at 10 Devonshire Place in Harrogate on Wednesday 21 September. 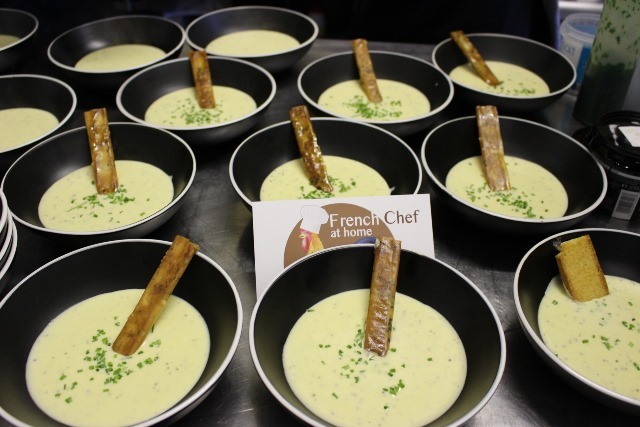 Following two successful events earlier this year, this will be the third time that we have hosted a French evening with a delicious five course tasting menu paired with generous flights of wine from Le Bon Vin. For our third visit, we are serving a deliciously, fresh menu which is sure to transport you back to your summer holiday. 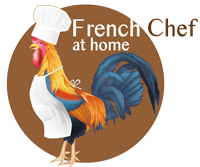 To book tickets visit http://www.10devonshireplace.com/products/an-evening-in-france-21st-september.